Allison Moorer has a new album out on MCA-Nashville Records. 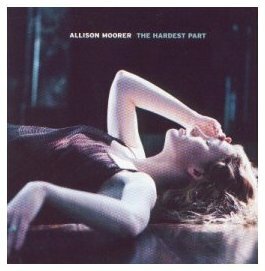 "The Hardest Part" is Allison's second album, but it is far from being a sequel to her 1998 release "Alabama Song". The Hardest Part is a collection of "stories of love" written by Allison and her husband Butch Primm and produced by Kenny Greenberg. The album has ten tracks, including the title track and single "Send Down An Angel" which is already out on a very entertaining video as well. Allison has a wonderful voice and as much as hate to compare artists to each other, I must say that I think of Cher in a cowboy hat every time I listen (especially "Send Down An Angel") to her music. Allison is the total package. She was included in a piece that Maxim Magazine did on beautiful new country stars. I think on the list of "up and comers" this is one to move to "made it and gonna be great".